Rochester and Chatham in the Early Nineteenth Century: The Real "Dickensland"
Left to right: (a) Entrance to the Guildhall on a rainy February day. (b) Detail of the façade. (c) The Mayor's Chair. 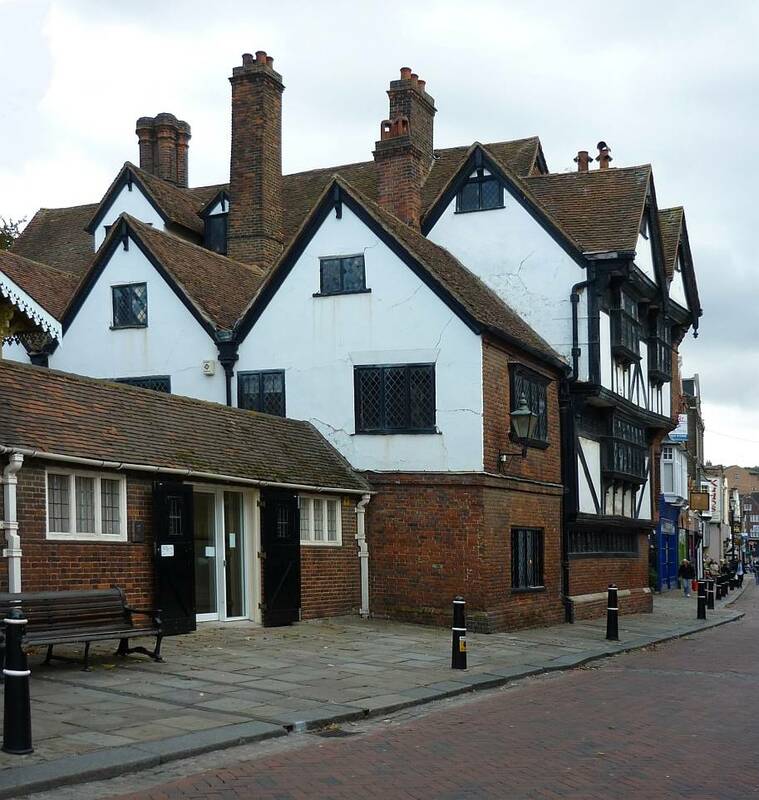 Although the Guildhall dates from the early eighteenth century, Rochester's origins are rooted in a mediaeval past centring on the decaying Norman keep of Rochester Castle and the cathedral church of the local monastery. The castle saw action in the sieges in the two Barons' Wars — in 1216 for seven weeks by King John, and in 1264 by Simon de Montfort. Badly damaged in 1381 during the Peasants' Revolt, Rochester Castle fell out of use, and in Dickens's time would have been a mere picturesque ruin. From the early fifteenth century, the fact that Rochester's secular orders elected a mayor and council points to its having become a thriving commercial centre by that date. At the Guildhall early in Great Expectations with money supplied by Miss Havisham Pip is legally apprenticed to Joe, this being but one of numerous specific references to Rochester and the marsh country in this 1861 novel. Portraits of King William III and Queen Anne, and the rococo ceilings (1695) are impressive reminders of the Guildhall's history. 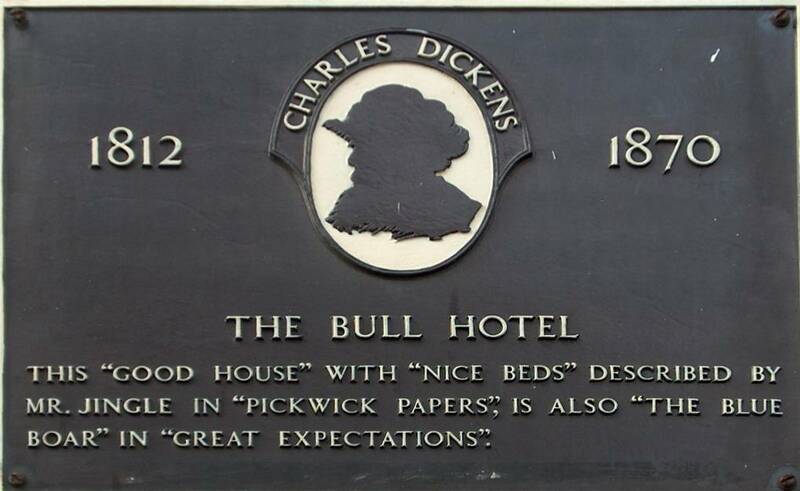 As Dickens remarks in "Our French Watering Place" (an essay on Boulogne), tourism can transform "innocent" places such as Rochester into "impostors of themselves." The council and people of Rochester ever since the early chapters of The Pickwick Papers have participated in making their city the centre of Dickens Country, a construction in particular of the late nineteenth century. In A Week's Tramp in Dickens Land Hughes and Kitton take the reader through the locations from Great Expectations and The Mystery of Edwin Drood; they introduce us to someone who knew Mary Weller, Dickens's old nurse and the narrator of the spine-tingling "Nurse's Stories." Not coincidentally, Mary Weller is the name of Sam Weller's wife late in The Pickwick Papers. To these nostalgic writers, the name is a trace of Dickens's imaginative world in this part of Kent. Dickens's tone and detail in his descriptions of background give such places value. It matters not whether Dickens drew the Kentish backdrop with "wonderful accuracy and realism" (Langton 2), but how used such scenes to appeal to Victorian readers' nostalgic longing for the old usages of life in county towns and country villages, a way of life that was rapidly vanishing even in the early decades of Victoria's reign and to which Dickens called to his readers' attention at Christmas 1854 in The Seven Poor Travellers in Household Words, set in Rochester's High Street. The Rochester Guildhall now houses the town's museum, which of course has memorabilia reinforcing the Dickens connection. This, however, is indirect, for the Naval Pay Office posted Dickens's father, John, not to the cathedral town but to the nearby dockyard town of Chatham in 1817. The family's home is still there on the hill above the docks; at Ordnance Terrace, Harriet and Fred Dickens were born. 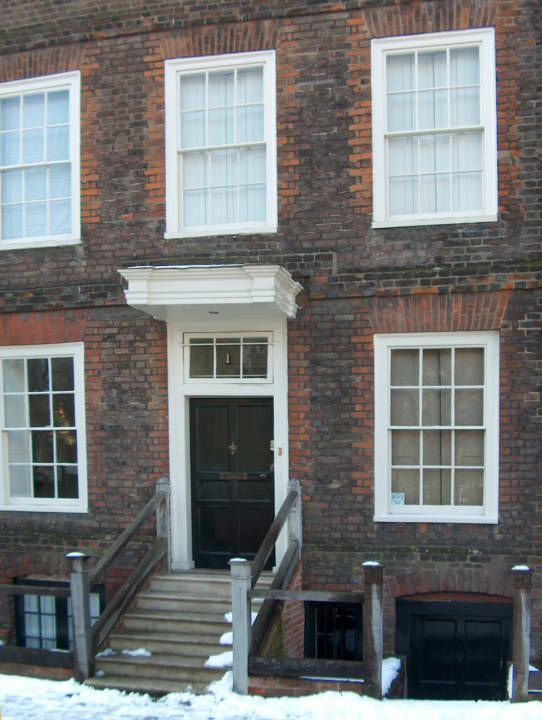 Then, beginning to suffer financial reversals, the Dickens family moved "down the hill" (and down in class) to St. Mary's Place; here, Charles Dickens first attended school, and here his brother Alfred Lamert Dickens was born. The heydey of the Medway basin's towns was the period of the Napoleonic wars, when the dockyard at Chatham was furiously producing ships-of-the-line for Great Britain's Continental Blockade. Between mid-century and 1900 the Medway towns rapidly industrialised; before that period, Rochester was the "Dullborough Town" of The Uncommercial Traveller and the Cloisterham of The Mystery of Edwin Drood, a sleepy cathedral town somewhat isolated from the metropolis to the north because it lacked a direct rail connection. The coaching service from Chatham, Brompton, and Rochester to Charring Cross in London involves a five-hour journey for in Great Expectations, so that the Medway towns were somehow untouched by modernity well into the nineteenth century. In those "Medway Novels" — Great Expectations and The Mystery of Edwin Drood, Dickens recreates history and creates memory, and in the process generated for the region "literary tourism." The construction of a dual-carriageway (freeway) in 1970 presented the Rochester Council with the opportunity to revitalise the "historic" high street, staging summer and Christmas Dickens festivals, and more recently "Dickens World" in the area of the Chatham Dockyards. 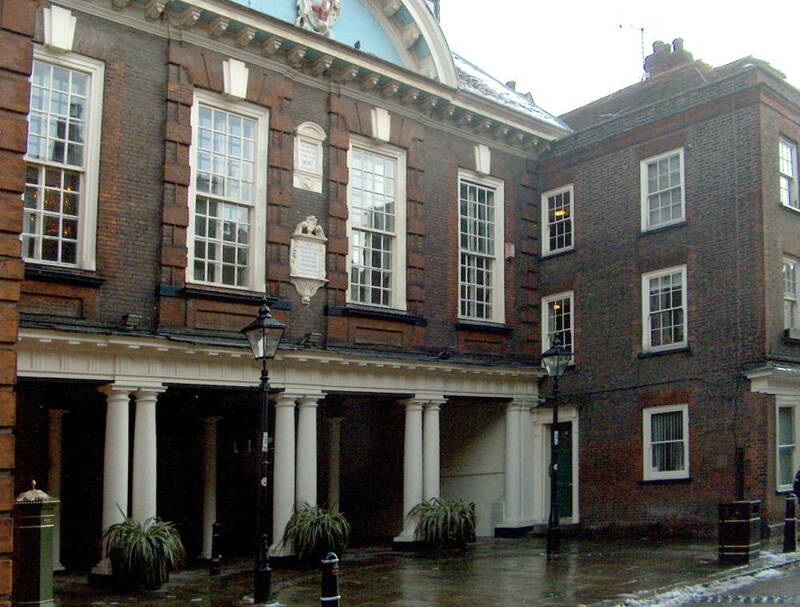 Dickens's first experiences with professional theatre were probably those in the Theatre Royal Rochester. For example, when he was just four that theatre advertised the following night's entertainment for 22 June 1816: The School of Reform, Or, How to Rule a Husband, together with the interlude Lover's Quarrel, and sundry "afterpieces"; the poster adds, "For the first time and for this night only; half-price at half-past eight. A man-made feature of the landscape dominating the Medway region during Dickens's childhood were the Hulks. Before the American Revolution, British Courts were accustomed to transport felons to the Carolinas; however, after 1781, the destination became "Botany Bay" in Australia. The sailless ships were temporary housing for transportees, who might regularly be seen in the Medway working in prison gangs around the dockyards. Subsequently, French prisoners-of-war were incarcerated on these floating prisons. After the Battle of Waterloo (1815), the British courts once again employed the Hulks as temporary prisons for Australian-bound convicted felons such as Magwitch in Great Expectations. As a child, therefore, Dickens might well have encountered prison work-gangs in the streets, and he would definitely have seen the Hulks anchored in the river. 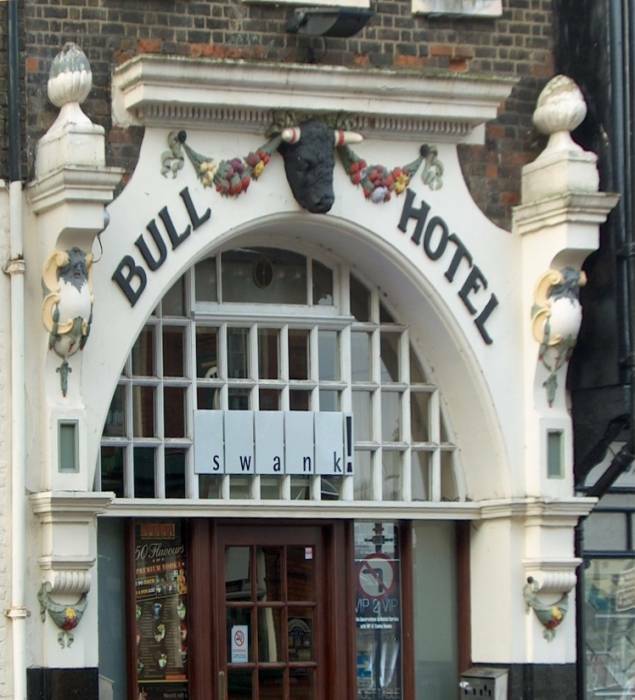 Left to right: (a) Entrance to the Victoria and Bull Hotel. (b) Detail of the doorway. 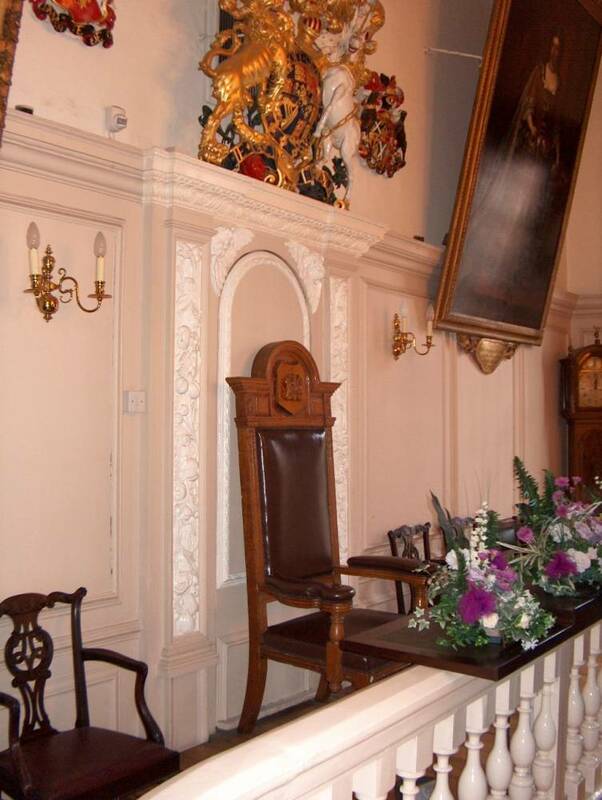 In the main room of the Rochester Guildhall, next to the Mayor's chair is a floor to ceiling portrait of the monarch on the throne when the Guildhall was constructed: "William III, King of Great Britain, France, and England. Given by Sir Joseph Williamson in the Mayoralty of Matthew Hales, Esq., 1707." 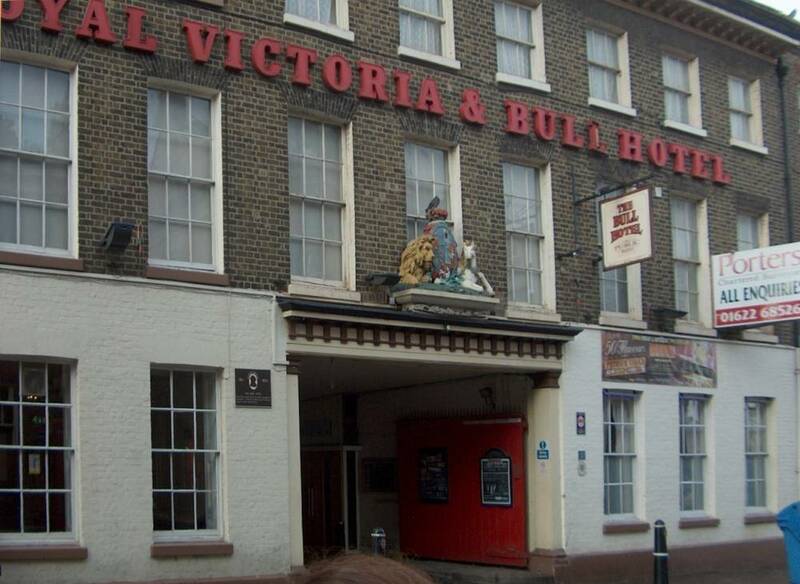 Immediately across the street at the top of the High Street is the old coaching inn The Bull Hotel (after Princess Victoria spent an uncomfortable night there in 1836, it became "The Victoria and Bull"). From here in the early instalments of The Pickwick Papers, Mr. Pickwick hires a carriage for the fifteen-mile drive to Dingley Dell, but the "immense brown horse" proves refractory, "drifting up the High Street in the most mysterious manner — side first, with his head to one side of the way, and his tail towards the other" (chapter 5, page 31). Another pair of royal visitors have left an indelible presence in Rochester because they visited houses that Dickens deployed in Great Expectations as Miss Havisham's ruined estate, "Satis House." The first royal visitor — in 1573, on her way through Kent to Dover — was Queen Elizabeth I, who stayed in Satis House on Baker Street, at the top of The Vines, formerly the Benedictines' vineyard until the Dissolution of the monasteries under her father, Henry VIII. It acquired its curious name, for "Satis" is Latin for "Enough," when her host, Richard Watts, asked her how she had found her accommodation. The next royal visitor was King Charles II, returning from exile on the continent to claim his throne. 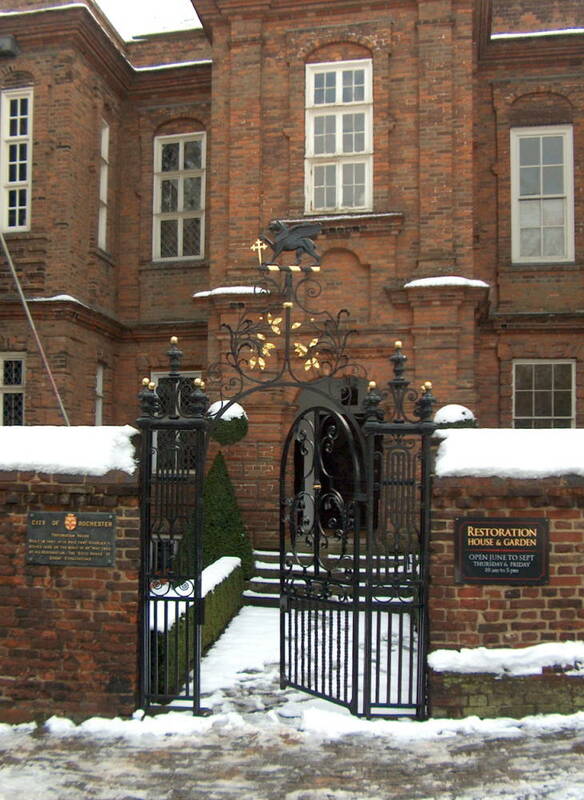 On the night of 28 May 1660, the young monarch stayed in Royalist supporter Francis Clarke's mansion in Crow Lane, at the bottom of The Vines. 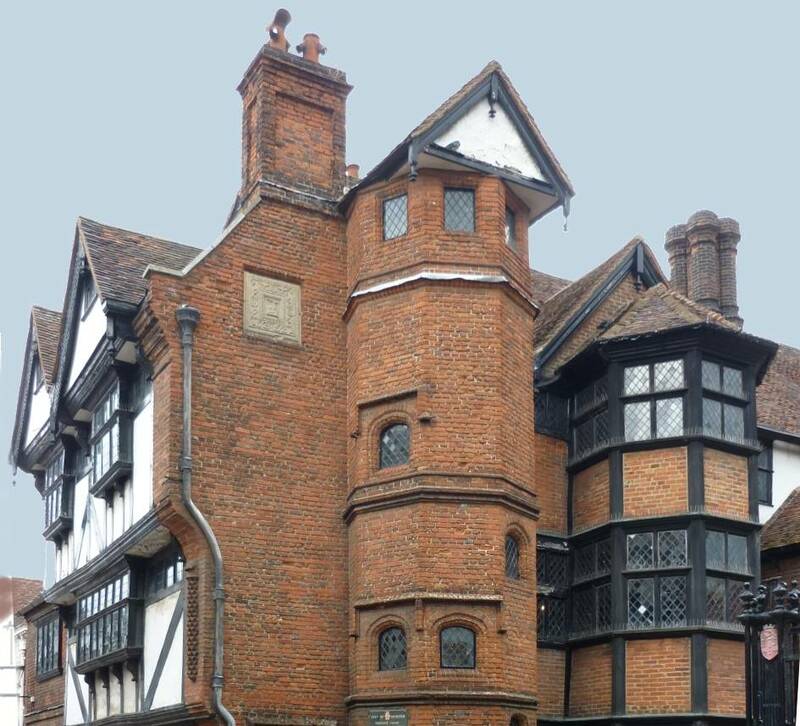 Subsequently known as "Restoration House," the Jacobean mansion we see today is actually a fusion of two medieval buildings. During the Civil War, a Parliamentary officer, Colonel Gibbon, Oliver Cromwell's Commander in the region, sequestered (confiscated) the mansion and made it his residence. The recently arrived Stuart monarch reversed the sequestration and returned the house to Clarke. 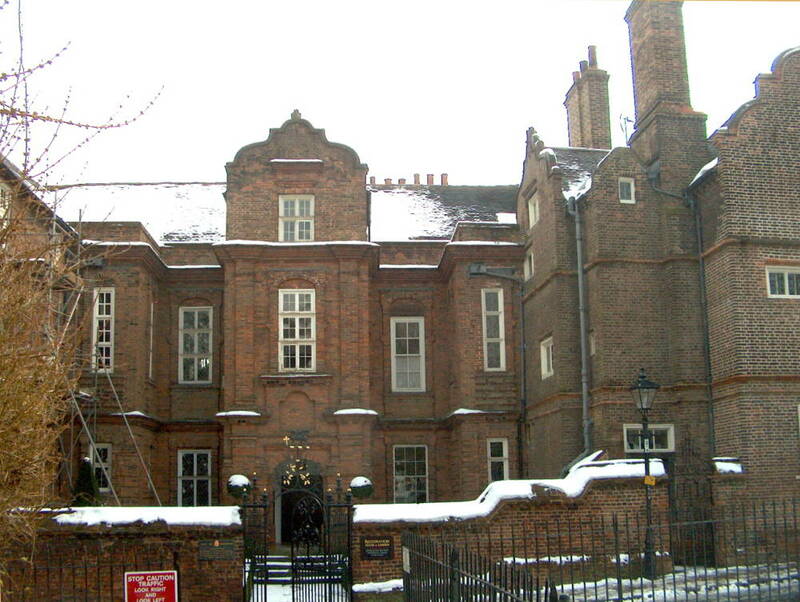 In Great Expectations, Dickens combined the name of Watts' home with the physical reality of Clarke's — which locals, by the way, insist is haunted by the ghost of a woman in Jacobean dress. 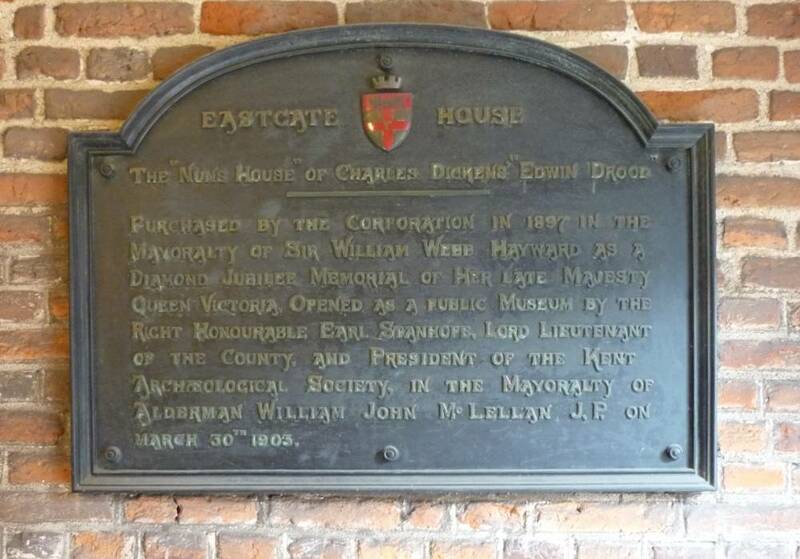 Sir Peter Buck, Clerk of the Cheque at Chatham Dockyard, built Eastgate House, a half-timbered Elizabethan building that dates from the late sixteenth century. It received its name because it faces the east gate of the Cathedral. 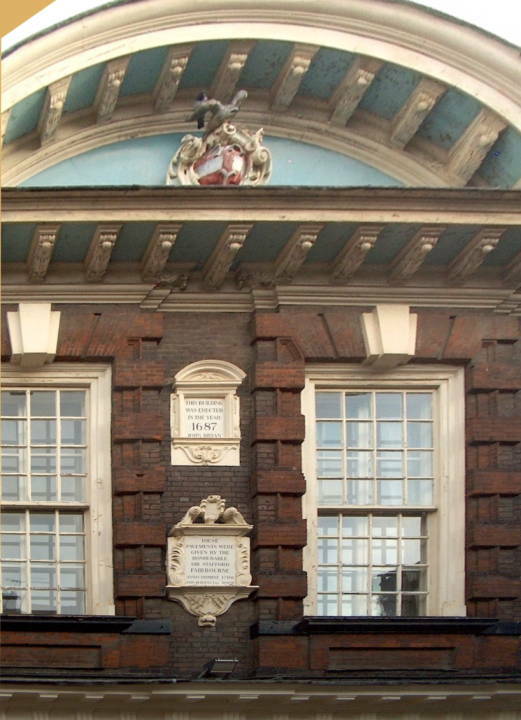 Formerly the Charles Dickens Centre, it now serves as an exhibition space and cultural venue. Left to right: (a) Minor Canon Row. (b) Reverend Septimus Crisparkle's house. Although Rochester's Minor Canon Row dates from 1723, the minor canons themselves are an artifact of Henry VIII's dissolution of the Benedictine monastery there in 1539. After Bishop John Fisher refused to acknowledge Henry VIII as the head of the Church of England, he was executed in July, 1535, but the Benedictine chapter, having surer survival instincts, capitulated and became the cathedral's "minor canons." The elegant Georgian houses appear in the sixteenth chapter of The Mystery of Edwin Drood, Dickens's fifteenth and final novel which celebrates the town with which he became so familiar between 1817 and 1822, but to which he returned as the proud owner of Gad's Hill Place nearby in 1858. 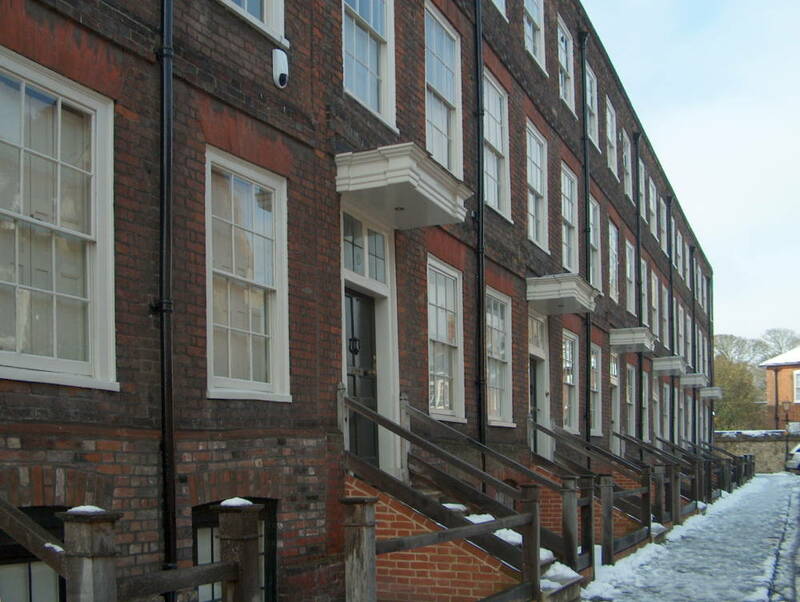 Dickens's Reverend Septimus Crisparkle lives in this picturesque row complex (the seventh and final unit having been added in 1735 to accommodate the cathedral organist). Minor Canon Corner was a quiet place in the shadow of the Cathedral, which the cawing of the rooks, the echoing footsteps of rare passers, the sound of the Cathedral bell, or the roll of the Cathedral organ, seemed to render more quiet than absolute silence. Swaggering fighting men had had their centuries of ramping and raving about Minor Canon Corner, and beaten serfs had had their centuries of drudging and dying there, and powerful monks had had their centuries of being sometimes useful and sometimes harmful there, and behold they were all gone out of Minor Canon Corner, and so much the better. Perhaps one of the highest uses of their ever having been there, was, that there might be left behind, that blessed air of tranquillity which pervaded Minor Canon Corner, and that serenely romantic state of the mind — productive for the most part of pity and forbearance — which is engendered by a sorrowful story that is all told, or a pathetic play that is played out. The most famous historical residents of the complex were children of a minor cannon, Dame Sibyl Thorndike and her brother, the novelist Russell Thorndike, who lived at No. 2 from 1886 to 1892. See Frederic G. Kitton's atmospheric rendering of the red-brick tenements which Dickens also mentions in the Christmas story The Seven Poor Travellers (1854) in Household Words. See also F. G. Kitton's "Minor Canon Row" (plate), in J. Cuming Walters' The Complete "Mystery of Edwin Drood": The History, Continuations, and Solutions (1870-1912) (London: Chapman and Hall, 1912. Clarke, Jeremy. "Dickens's Rochester and Chatham." Presentation to the 2012 Dickens Conference, "A Tale of Four Cities: Dickens and the Idea of 'The Dickensian.'" Guildhall, Rochester. 6 February 2012. Davis, Paul. Charles Dickens A to Z: The Essential Reference to His Life and Work. New York: Facts On File and Checkmark Books, 1998. Dickens, Charles. "Pickwick Papers (1836-37). Il. Hablot Knight Browne. The Household Edition. London: Chapman and Hall, 1873. Langton, Robert. Charles Dickens and Rochester. London: Chapman and Hall, 1880. rpt. Rochester: Old Towns Books and Maps, 2009.